Who else loves visiting markets? When I was in Saigon (Ho Chi Minh City), I heard and read a lot about the famous Ben Thanh Market. And as good, and worthwhile, as Ben Thanh Market was to explore, there’s another market, a little further out of the touristy area of town, within Saigon’s Chinatown, that I liked even better. Binh Tay Market (known in Vietnamese as Chợ Bình Tây) is one of the major markets in Saigon. It’s the dominant business hub and attraction in Cholon, Saigon’s Chinatown. 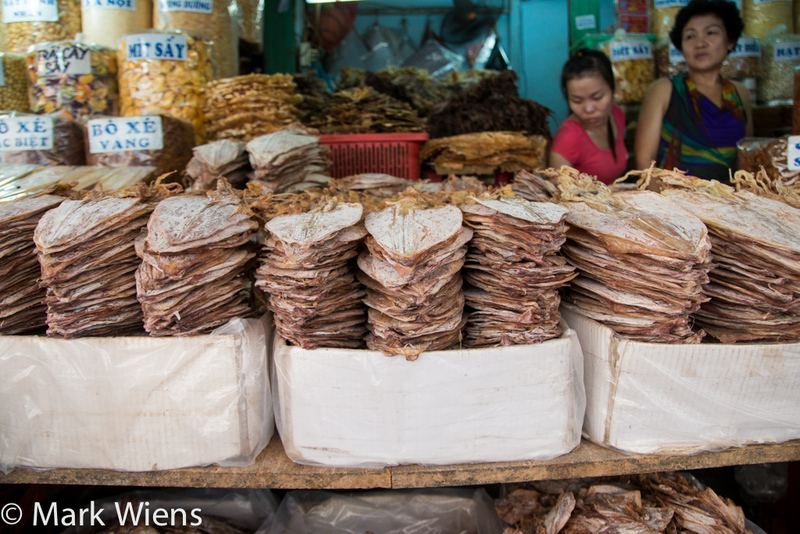 Visiting markets, because it directly relates to food (and eating), is always one of the top things I look forward to doing when I travel, so I was extremely excited to visit Binh Tay Market one day when I was in Saigon… and I thoroughly enjoyed my visit. This post is about everything I did and saw at the market, and some of the temples I visited as well. Unlike Chinatown in Bangkok or Manila, or even in other places around the world like Honolulu or London, Chinatown in Saigon isn’t all that praised, or recognized as a real main area of Saigon to visit. One of the reasons I guess, is because Cholon is actually so huge, that it takes up half of District 5 – it’s not one of those cute and condensed little Chinatowns, with flashing lights and Chinese signs, like in some other cities – and it doesn’t even have a real main “Chinatown looking,” street. Instead Cholon (Chợ Lớn) is a sprawling section of Saigon, where life rapidly flows, and because all of Saigon has so much Chinese influence already, it really sort of blends into other parts of the city. 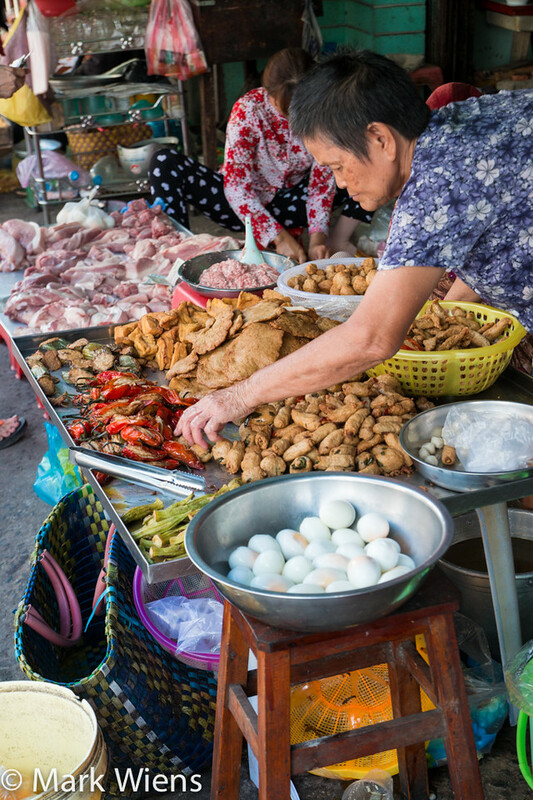 While there are many markets within Cholon, Binh Tay is the central market – the largest and distribution hub for all things food and clothes in the area. 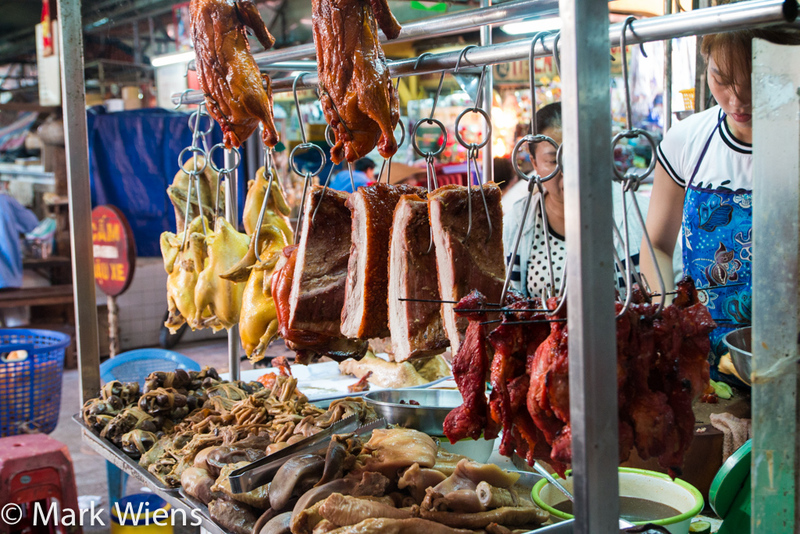 The market, along with a few scattered temples, are the main draws for visiting Chinatown in Saigon. 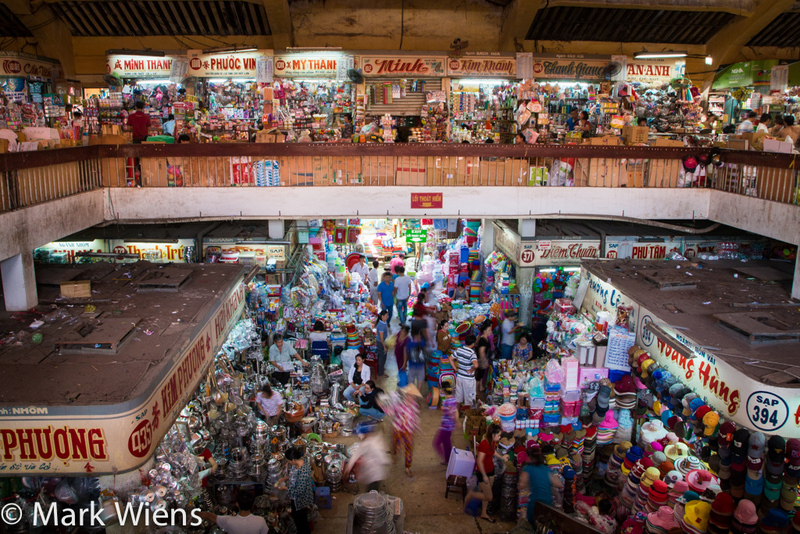 There are a few different parts to visiting Binh Tay Market: the outside wet market street, and the inside section of the market. If you look at map layout closely (see photo above), you’ll see that the numbers, which are stalls in the market, go up the 600’s! I’m not sure if all numbers starting at 1 are included, but I can say there are hundreds of stalls in the markets – it’s literally a maze of clothes and fabric, and there’s even a park and shrine in the center. But before I get started with the inside of the market, I’ll begin with some photos of the outdoor market street, located to the side and behind the market. That’s where I began my exploration of Binh Tay as soon as I arrived in the morning. 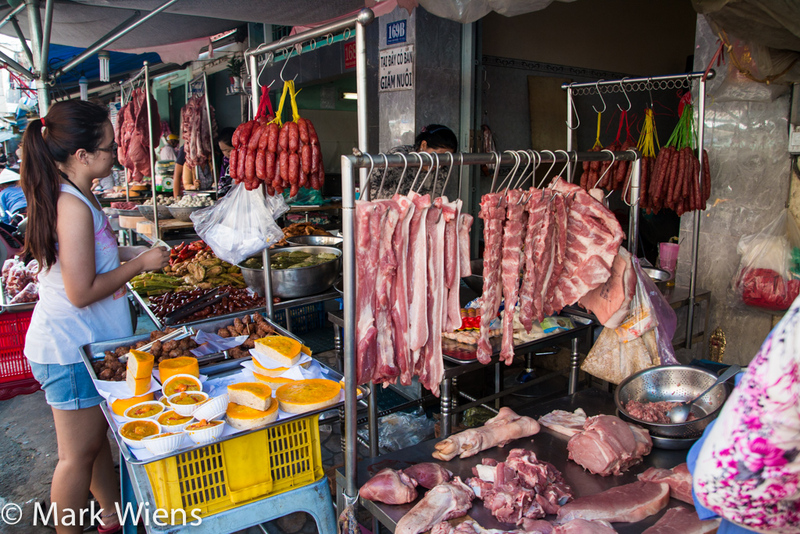 If you’re a lover of fresh wet markets, like I certainly am, the lanes outside of the back of Binh Tay Market, mostly along Phan Van Khoe street, will fulfill all your senses. 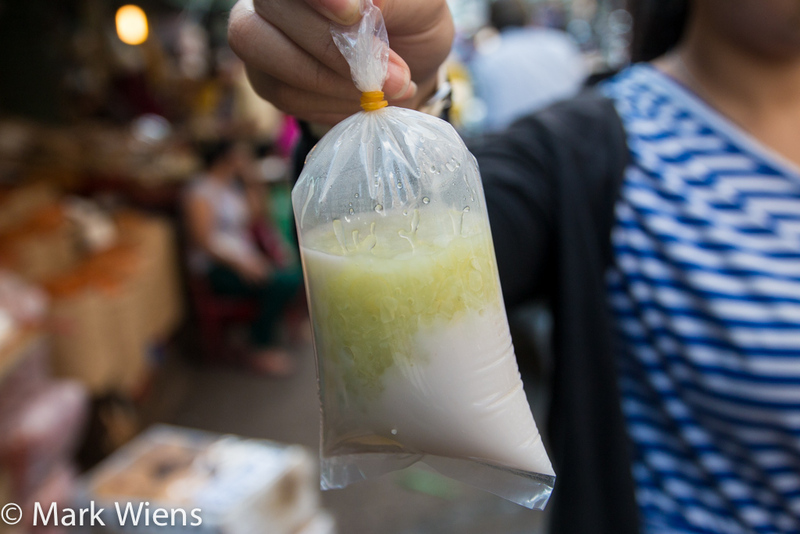 I got the tip to visit the wet market in the morning from Robyn Eckhardt over at Eating Asia. The market, which I believe is only open in the morning, from probably 5 am or so until it wraps up around 8 or 9 am, is filled with all fresh ingredients you can imagine used to cook Vietnamese and Chinese food. I arrived at about 8 am, so I honestly was a little on the late side, but luckily the market was still thriving, and though it was still chaotic and energetic, I would guess it to be even busier a little earlier – like from 6 am – 7 am or so. As soon as I stepped onto Phan Van Khoe street, that beautiful organized chaos of Vietnamese markets overwhelmed me, and made feel right at home. Other than sitting down to eat, there’s nothing I enjoy more than visiting wet fresh markets – it’s not only an opportunity to see what ingredients go into cooking, but also to observe the local culture. I ended up walking back and forth a number of times, taking lots of photos and videos, and stopping every now and then to see unique ingredients or say hello to one of the many friendly vendors. The market included a mixture of meat and seafood of all kinds, plus plenty of fruit and vegetable vendors scattered along the street, some selling off tables, others just selling off tarps on the ground. The market, with its eclectic mix of ingredients and energy, reminded me of both the amazing street food markets in Yangon and in also the interesting Chinese morning market in Kolkata. Along with all the fresh colorful assortment of ingredients, there were also stalls selling pre-cooked food, most of which was for takeaway eating. I’m not a big desserts eater, in fact, I barely ever seek out sweet things to eat. But while walking around and stopping to take photos, a lady caught my attention, smiled at me, and asked me to take her photo. The bag of dessert cost just 5,000 Vietnamese Dong ($0.19), and after buying for takeaway I sampled it when we sat down for breakfast a little while later. It tasted very similar to something you’d find in Thailand – later found out it was corn with sticky rice, combined with thick coconut cream. After exploring the outside wet market for at least an hour, I was hot and sweaty, and I all I wanted to do was take a break and sit down for some food and drink. Luckily, positioned at the back end of Binh Tay Market, is a beautiful food court, which includes a long line of vendors. Many sell takeaway food, or food to deliver to other markets sellers, but most have a few small tables, or bar countertops, where you can slurp down some delicious food on spot. 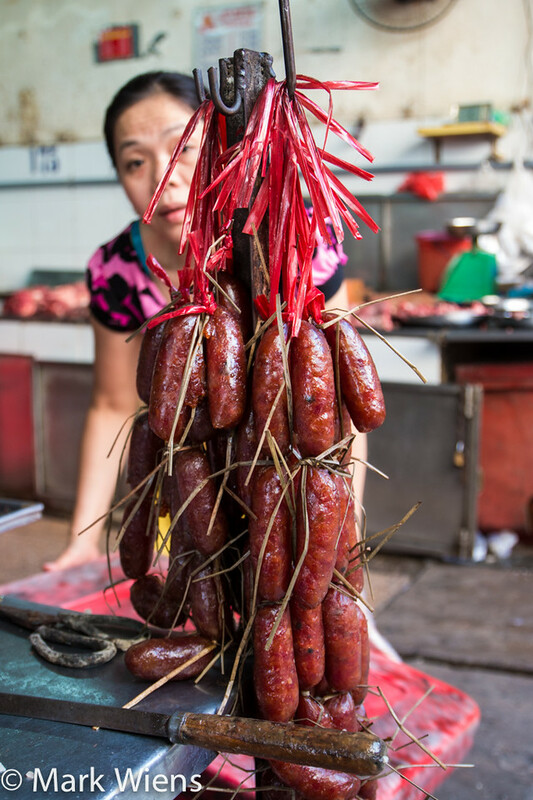 Within the same food court section, there were also some fresh meat vendors, and some Chinese sausage vendors as well. I guess the meat served at the food court was nice and fresh. After making multiple loops around the food court, contemplating what delicious Vietnamese food I wanted to eat, I finally settled on a stall that was one of busiest, located on the far right hand side (while facing the food court entrance). I ordered up the special, a plate of curly noodles topped with stir fried beef mixed with a few onions, peppers, and bean sprouts, and finally topped with a sprinkle of black pepper and cilantro. I’m not a huge fan of instant noodles, and I actually didn’t know I was ordering stir fried instant noodles when I ordered this, but since I ordered it, I decided to enjoy it anyways. Though they were instant noodles, I have to admit, they were very tasty. And the beef, which was sautéed in oil and soy sauce, was tender, and delicious. After a great breakfast at the food court, and a cup of coffee to wash it down, I was ready to start walking around the indoor section of Binh Tay Market. The small courtyard in the middle of the market is a great place to get your bearings and proceed in a desired direction. It’s also a nice place to catch a breath of fresh air from the tightly packed stalls and alleys of the market. 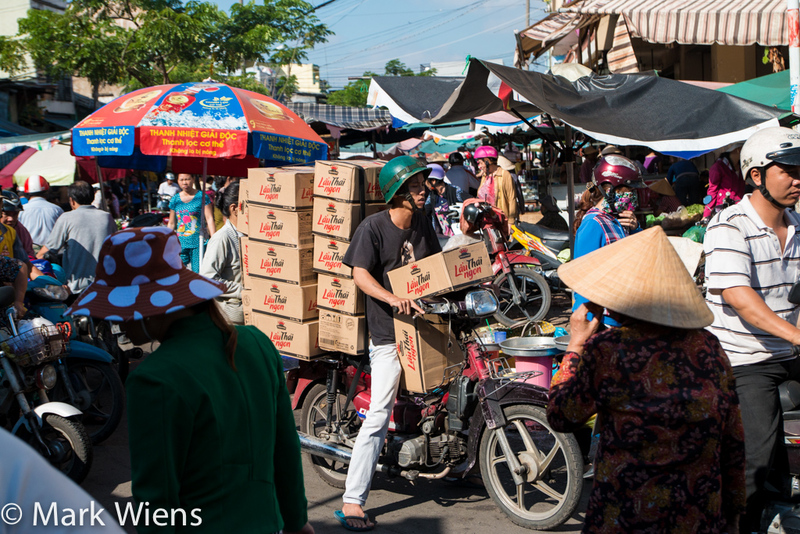 Within the lanes of Binh Tay Market, it was surprisingly quiet and peaceful – though I’m sure when it’s really busy it can be a bit hectic with other shoppers and people delivering this and that. But compared to the outside fresh wet market, inside was calm and sleepy, and many vendors just sort of hung out and waited for customers. You’ll find just about everything food-wise you can imagine within the market, but mostly the dried and preserved types of ingredients, rather than fresh ingredients (which are available at the market outside). I was amazed at the vast quantity of nuts and dried fruits available. Being a lover of nuts, I was highly tempted to buy a few kilos of cashews and almonds, but ended up not getting anything. 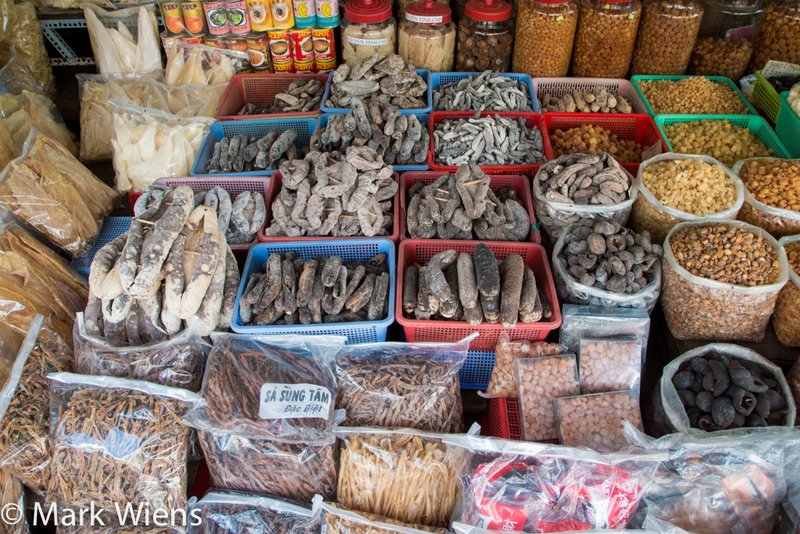 There were all sorts of interesting Vietnamese and Chinese ingredients, from spices to dried seafood to herbs and snacks. From what I saw, the prices seemed to be quite a bit lower than the prices I noticed at Ben Thanh Market for the same things. 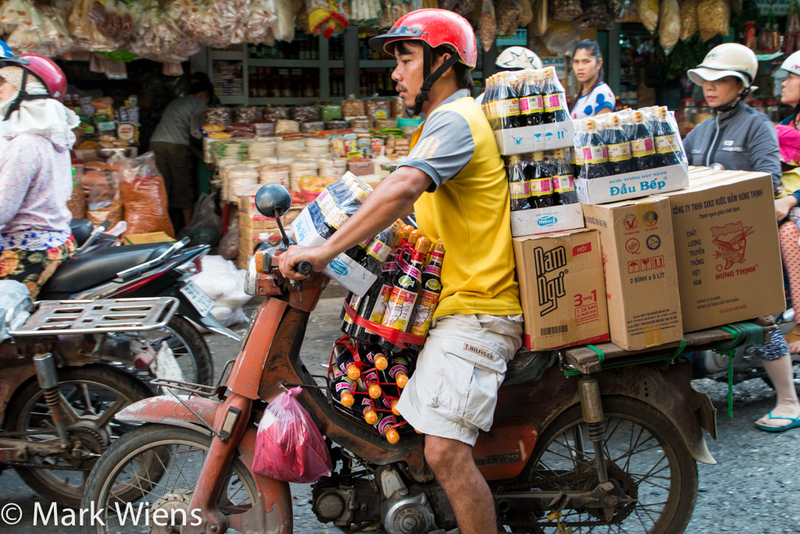 So if you plan on doing a lot of food shopping when you’re in Saigon, you’ll probably want to make it a point to get to Binh Tay Market. What type of face mask would you like? Along with dried food and spices, the markets was well stocked with hundreds of vendors selling every type of Vietnamese clothing you could ever want. If you’re looking for face masks, with everything from polka dots to Burberry, you’re in luck. There were also numerous stores stashed high with every type of Vietnamese cookware imaginable, from pots and pans to dishes and utensils. If I had more space, I would have definitely purchased some cookware to bring back to Thailand with me. After spending a few hours wandering though the colorful packed lanes of Binh Tay Market, and cruising through both floors and countless little passageways, I was ready to move on and explore a few of the other attractions in Cholon. Because Saigon’s Chinatown is so spread out, and since the city doesn’t exactly have nice wide pedestrian sidewalk system, it’s not all that convenient to walk around. 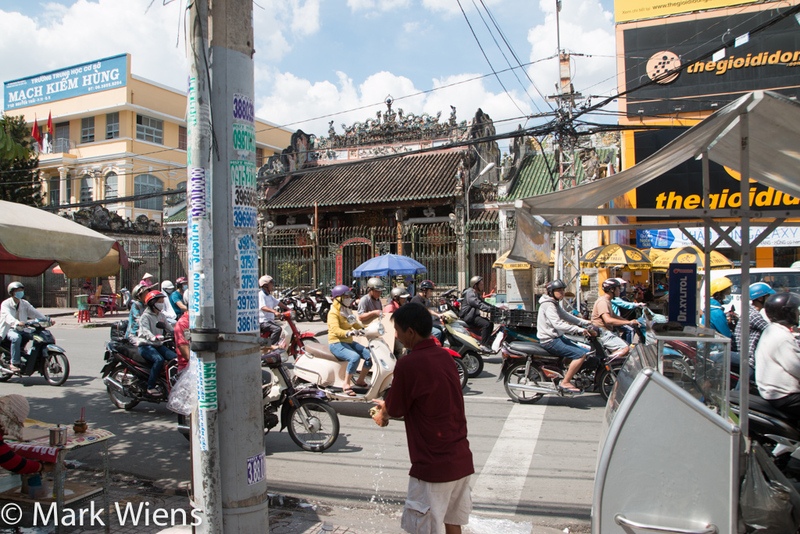 But I like to walk, so I decided to walk to some of the famous temples and churches in Cholon – but you could alternatively jump in a taxi or on the back of a motorbike. 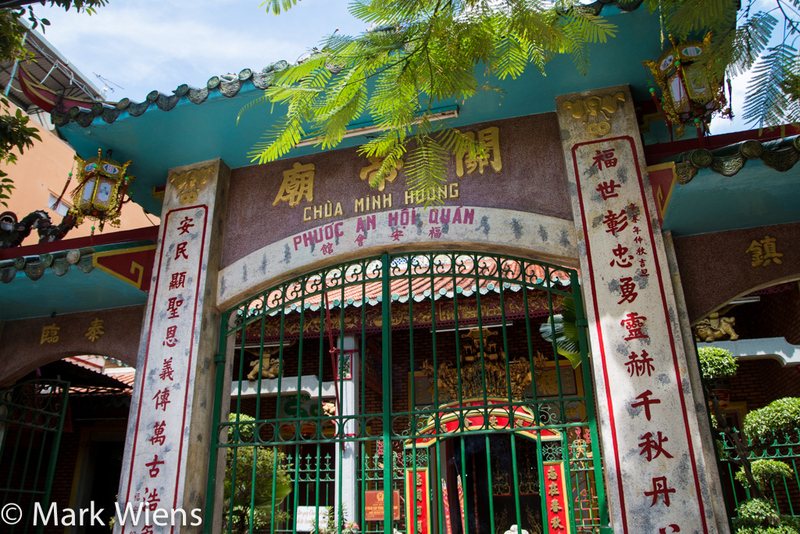 Located within Cholon, is Cha Tam Church, and it took me about 15 minutes to walk there from the market. 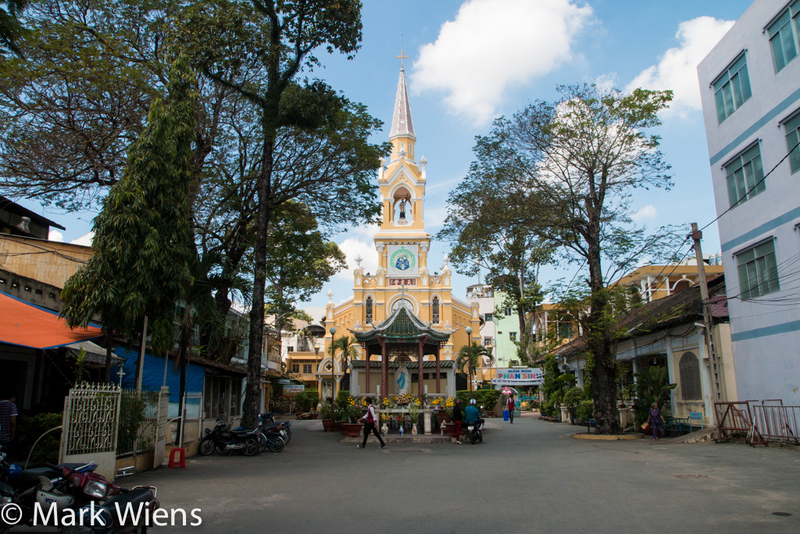 The Catholic church is famous for being the place where Ngo Dinh Diem, the first president of South Vietnam, was arrested. 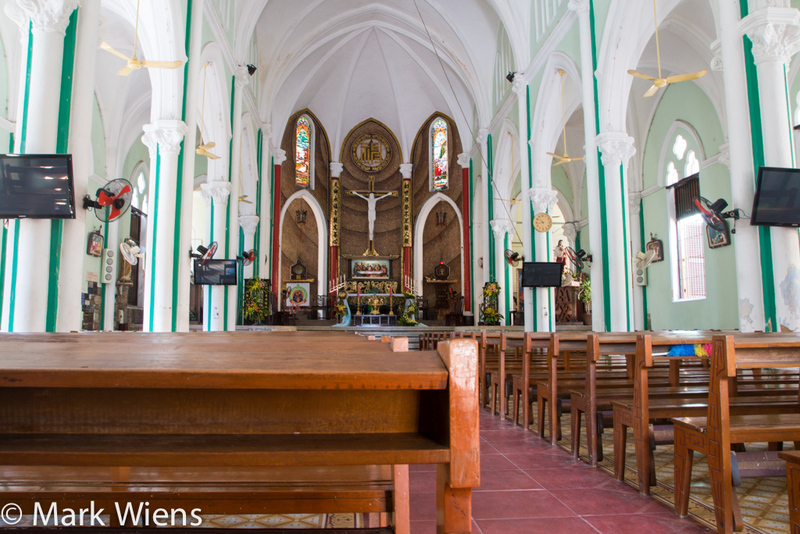 According to the article by Lonely Planet, the church is still used frequently, and has a congregation of both Vietnamese and Chinese, with services held daily. It’s not the most fascinating church to visit, but if you happen to be exploring Cholon, it’s not a bad place to take a rest from the busy streets outside. 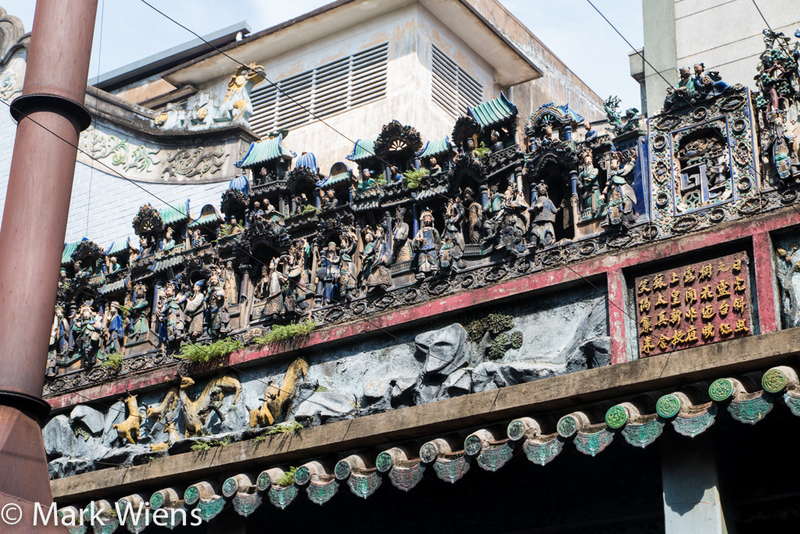 Moving on, I continued walking to Phuoc An Hoi Quan, a Chinese Taoist temple, located right along the busy Hong Bang street. The view from the street made it looks like just an average temple with an old entrance, and it really didn’t look like there was going to be much inside – it actually almost looked like someone’s home. But as soon as I stepped inside, the room opened into an incredibly ornate and decorated hall, with red and gold Chinese characters filling the pillars and walls. 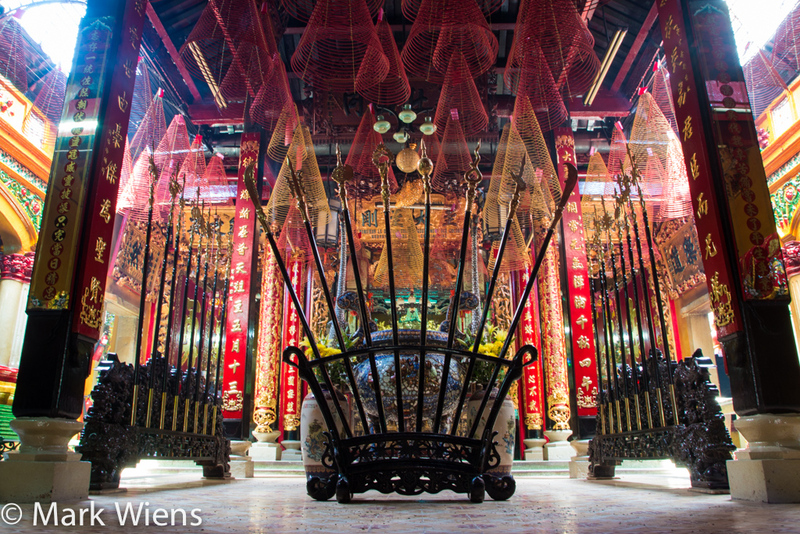 The Phuoc An Hoi Quan temple was quiet, and peaceful, and it made another good off-the-beaten-path stop off. 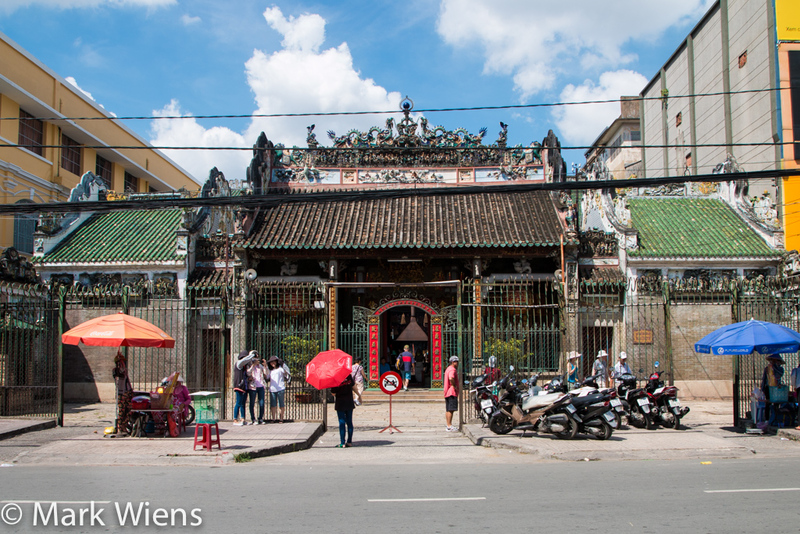 For my final stop in Saigon’s Chinatown, I headed over to the well known Thien Hau Temple, another Taoist temple in Saigon. 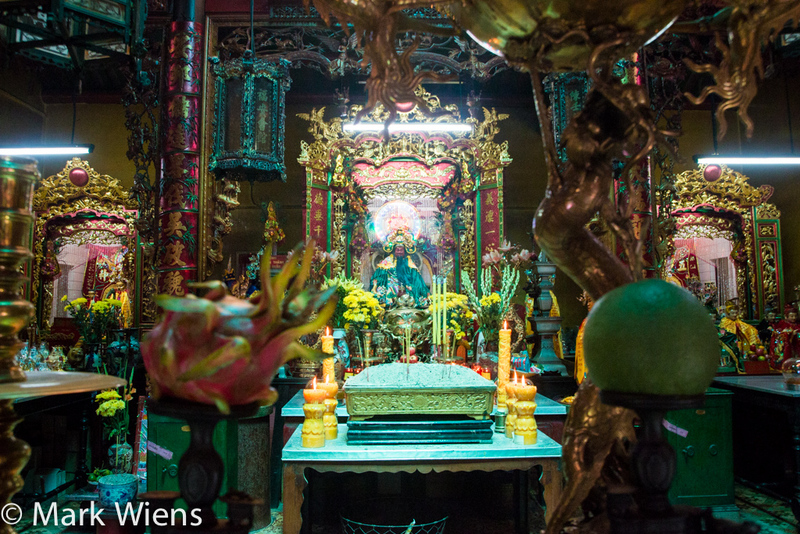 There are many Thien Hau temples around the world, I actually visited one in Kuala Lumpur as well. From the outside, the temple looked incredibly old and dark from years of being weathered. Inside, it was much larger than Phuoc An Hoi Quan, and not nearly as ornate with gold, although it was still well decorated. 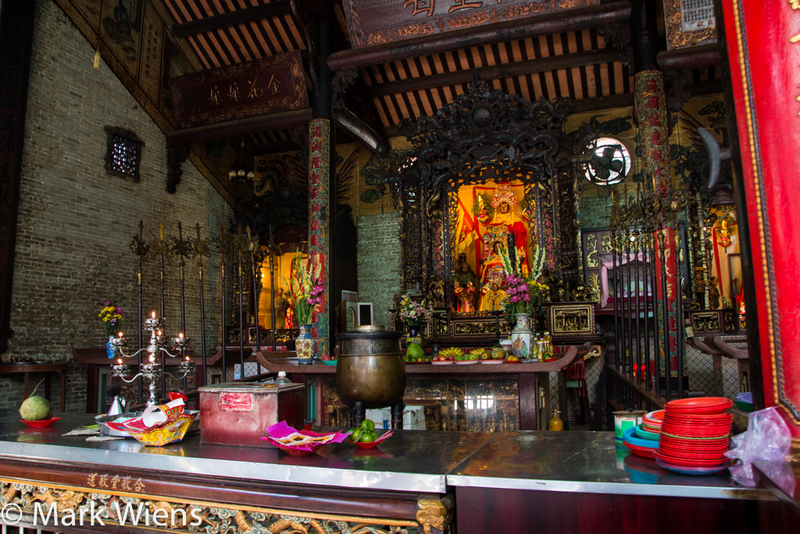 At the front of the temple was the main shrine, dedicated to the Taoist goddess Mazu. 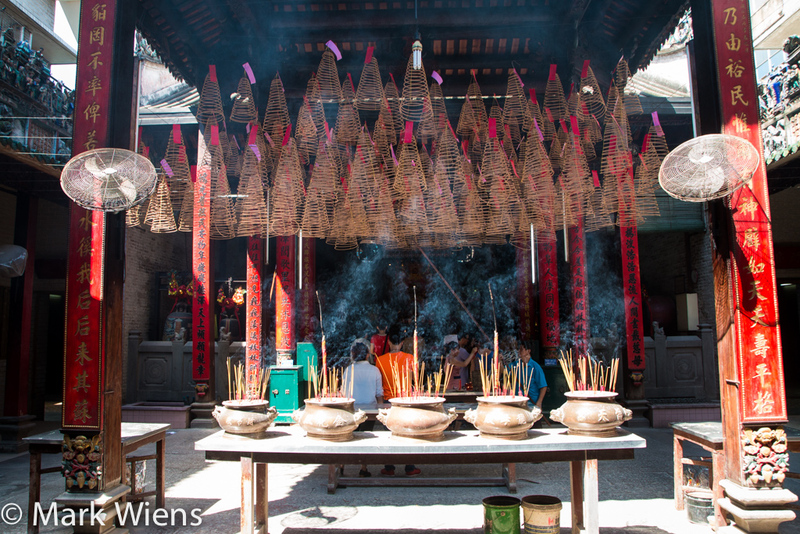 In front of the main shrine at Thien Hau Temple was a courtyard filled with burning incense, and dozens of incense coils hanging from the ceiling, slowly burning and smoking. The entire temple seemed to be rising in smoke. Some people that visited the temple offered sticks of incense, while others purchased the big coils, lit them, and hung them from the ceiling. 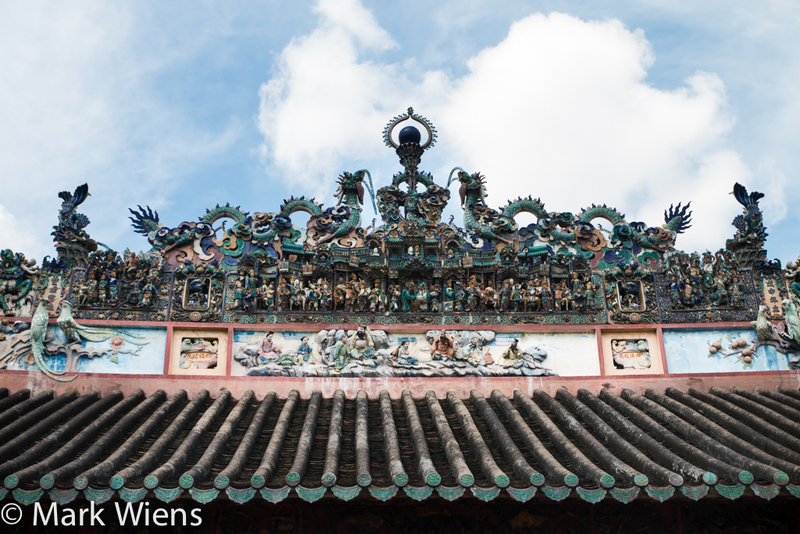 Another part of Thien Hau Temple that was interesting to see were the intricately carved sculptures within the top facades of the building. 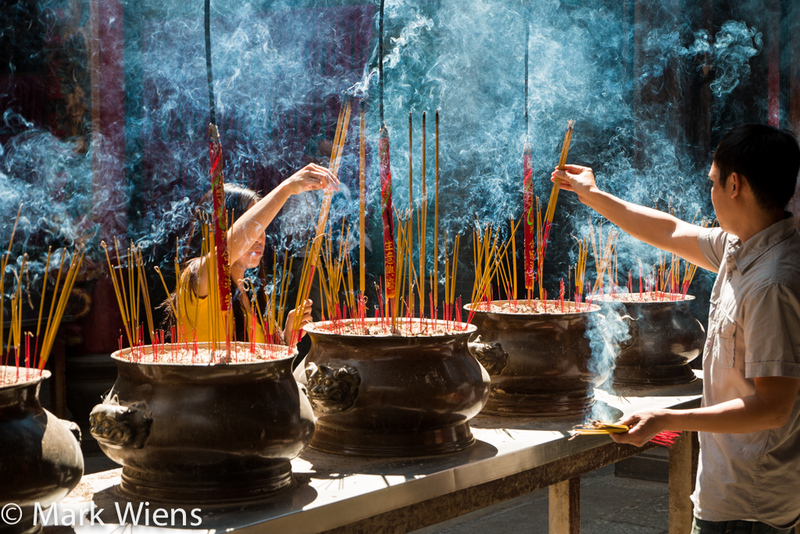 The colorful scenes had been black-washed by years of incense smoke. 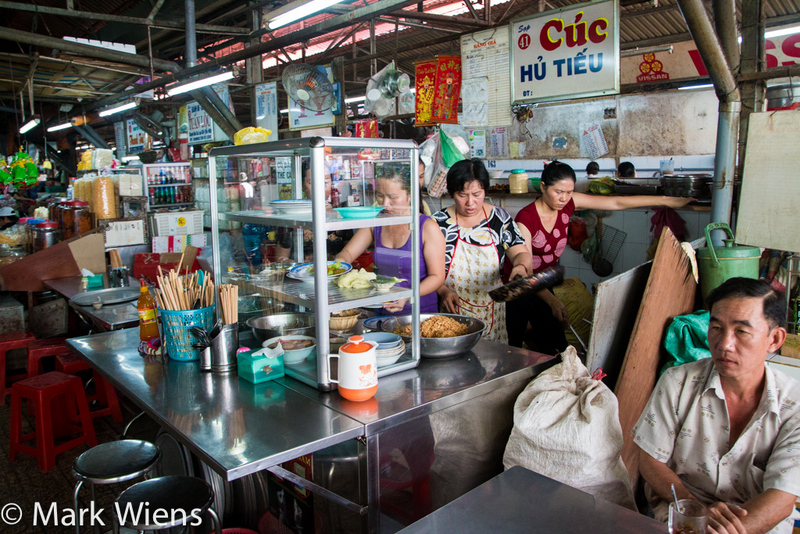 Visting Cholon and Binh Tay Market is one of the best things to do when you’re in Saigon! If you have a few minutes, make sure you watch the full video exploring Binh Tay Market – it was one of the highlights of my trip to Saigon! Binh Tay Market is one of the largest markets in Saigon, Vietnam, located within Chinatown, which is better known as Cholon. 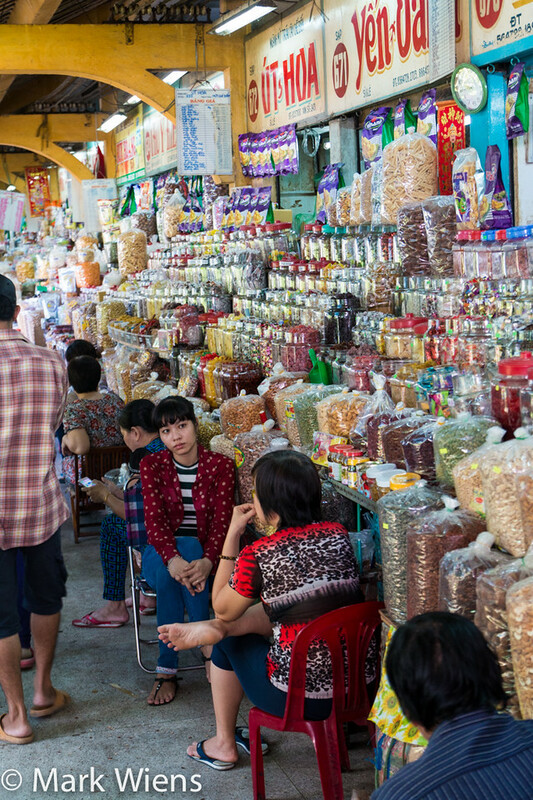 It’s quite similar to Saigon’s Ben Thanh Market, but it caters more towards local Vietnamese and Chinese shoppers, and less to tourists, so it has fewer souvenirs and more local Vietnamese products. 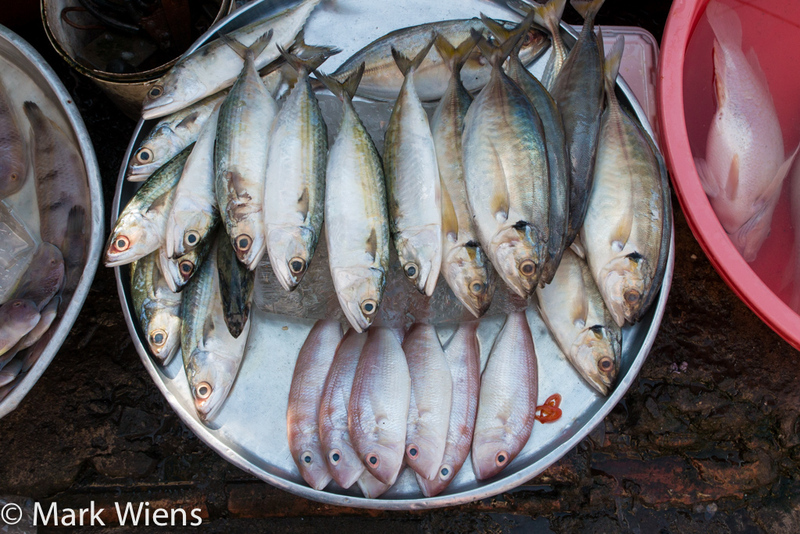 While I was in Saigon, I spent a day wandering around Cholon and Binh Tay Market. I especially enjoyed the outside fresh wet market in the early morning and the wonderful food court. 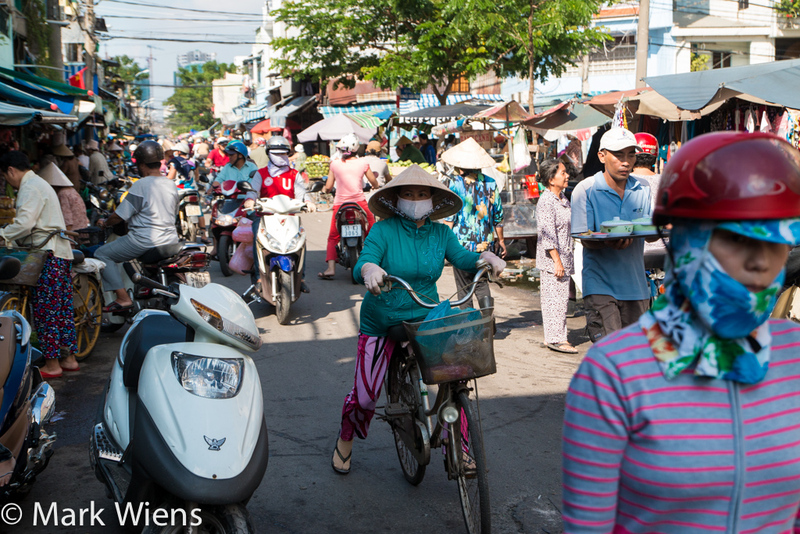 If you enjoy exploring markets, or if you like to shop, Binh Tay Market is a place you must visit when you’re in Saigon. 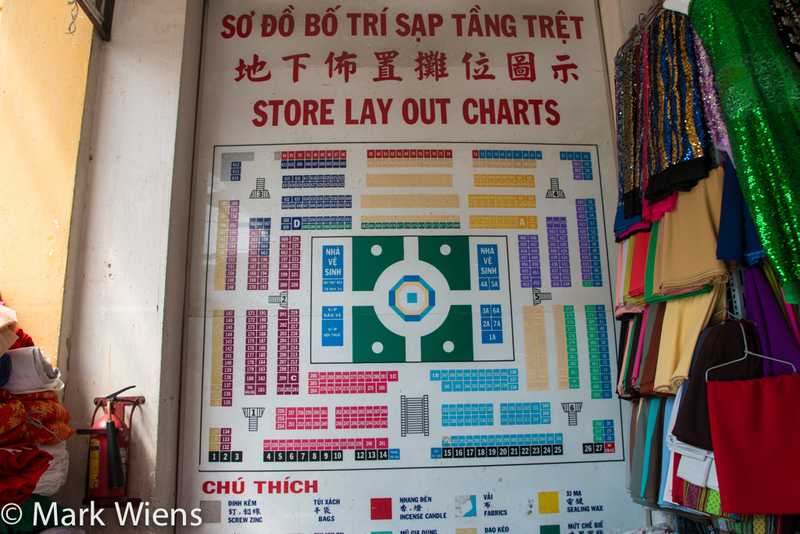 Whatever you’re looking for, if it’s made or used in Vietnam, you’ll probably find it somewhere within Binh Tay Market. 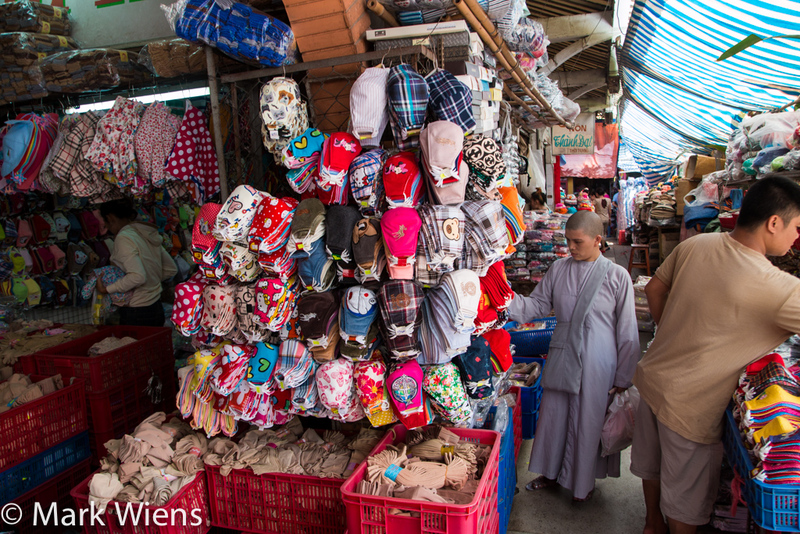 Safety: Be careful of your belongings when you’re walking around both Binh Tay Market and other parts of Saigon. 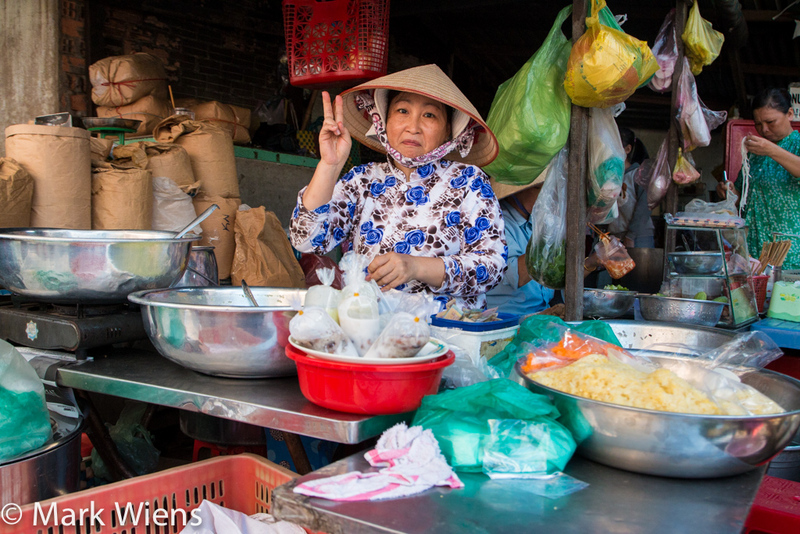 While walking around with my cameras, I was warned by many local vendors to be careful. So if you like to take photos like I do, just be cautious and don’t be too attached to anything you take with you. 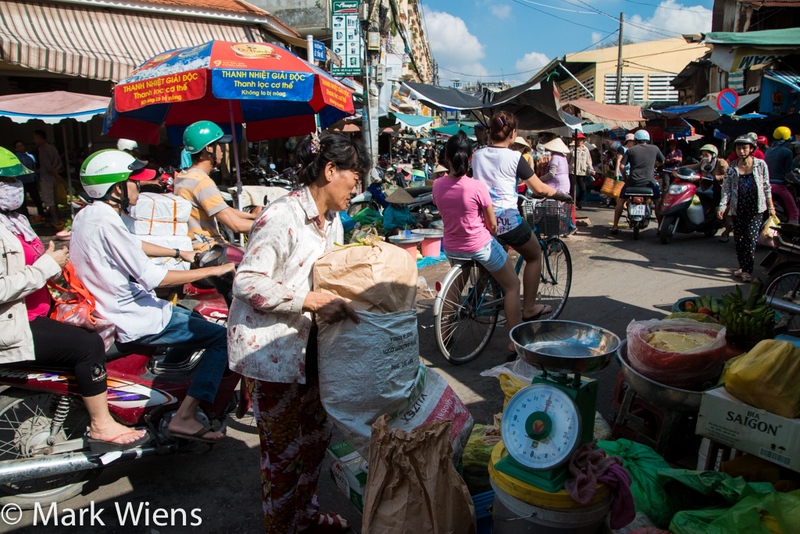 How to get there: The market is located in Cholon, in District 5 of Saigon. The first time I went, I took a taxi from the hotel I stayed at near the center of town for 110,00 Vietnamese Dong, and the ride took about 15 minutes. Will be in Saigon next week so enjoyed your blogs. Can’t seem to get your email ? I really appreciate your videos on the different cuisines of the world. Being of Vietnamese origin I especially enjoy your travels in Vietnam, but also in South East Asia. I love Thailand but unfortunately I know too little (stay too short). When I watch your videos I am always amused to see your eyes when you eat: it is a great pleasure for you! I also downloaded your guides on Vietnam, Singapore. I admire the excellent quality of your videos and photos: what cameras do you use to shoot or take pictures? Is it your wife who is filming you when you are eating? Sorry for all these questions, but I’m really passionate about what you do! Hi Ba, great to hear from you, and thank you very much for your support and downloading my guides. Right now I’m using a Lumix, details on this page: https://migrationology.com/travel-resources/ And yes usually it’s my wife filming when I’m eating. No problem, thanks! Great explanation of the market, I now know exactly where to go, when to be there, and what to expect. Exploring new places is always fun, and having your guide just made it easier for me to make the best of my limited time here in Ho Chi Minh City. Thanks Mark. Hey Robert, great to hear this is helpful. Hope you have an amazing visit. Greetings d reading yourMark—-I am a veteran professional still photog from New York City, on my third visit to Vietnam, beginning in 1978. Presently, I am on a “bucket listed” self-assignment in Saigon until January 2, 2016. I fully enjoyed and will no-doubt benefit from your blog-style visit to Cho Binh Tay. Your selfie video brought a smile to my face. After looking at your stills and reading your clear text, I’ve decided to arrive at the wet market at about 6am. 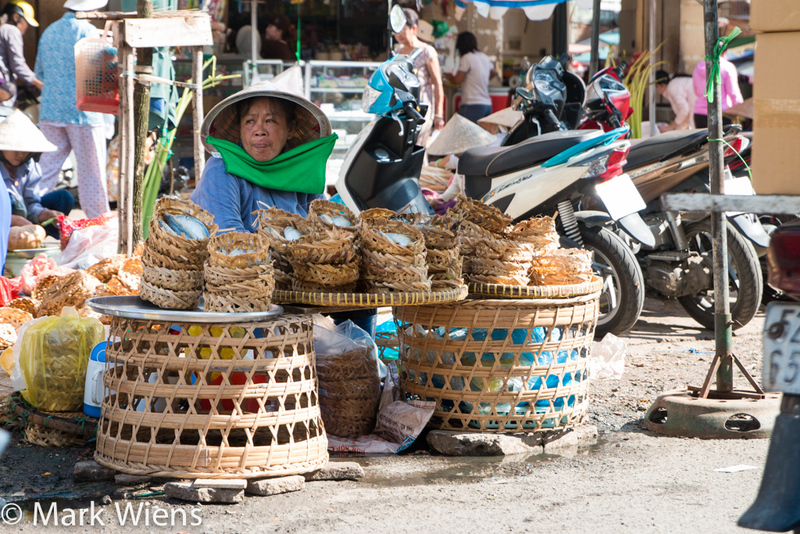 It’s similar to my experience of the wonderful Hoi An market, which I suggest you visit, if you haven’t already. I also would like to photograph Cho Lon in the evening. I will most likely return to my Dist. 1 hotel during the hottest part of the day and return at night. Please email me, and I will share some of my best photos with you. Hey George, good to hear from you, and thank you for reading my blog and watching my videos. Hope you had a great time at the market. My e-mail is [email protected] Thanks! Nice review. Thanks for the heads up, appreciate it. Thanks Duncan, glad you enjoyed it. Great photos Mark, makes you feel as if you’re almost there, and I like the fact that you eat EVERYTHING. Wish I was there. 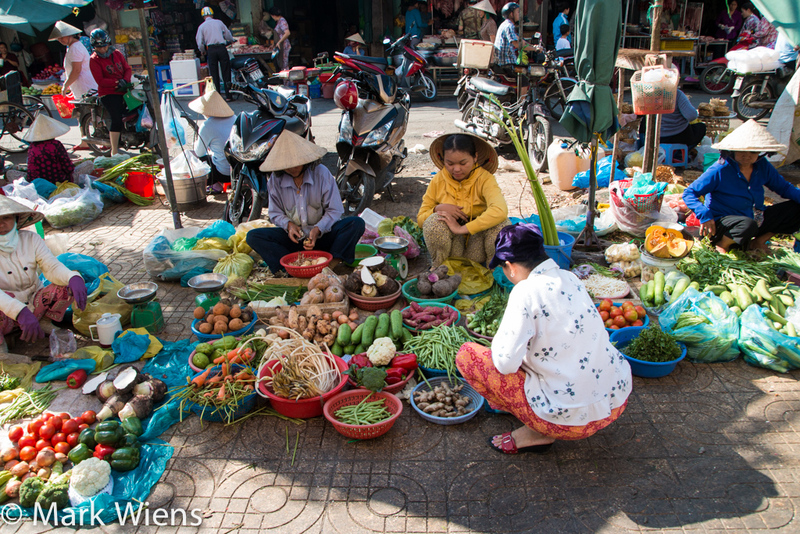 A very comprehensive description of the Binh Tay market. I like the spring rolls and the banh mi video. Had visited Hanoi five years ago but will look forward to go to Ho Chi Minh in the future with all the recommendations from you. Thank you very much Debby, hope you can visit Ho Chi Minh City again in the future. Great piece, Mark! Your photos are stunning! I love temples and I really like the look of Thien Hau. We’ll be back in Saigon later this month, so we’ll be sure to check it out. Thank you very much Andrea, have a great upcoming trip to Saigon. We were just there in all these places today! We are a group of 6 traveling through Thailand and Vietnam and we literally visited every restaurant you posted here. Every food we tried was so so good! Thank you for all you do. This is amazing to hear, thank you Aga, and so glad that you’re having an amazing trip and enjoying the food. Thank you for carrying the beauty of Vietnam to the world. I enjoy your great travel articles & cannot wait to start my own travel trip. Hello Nhien, you’re welcome, I really enjoyed my trip to Saigon, an amazing city, delicious food, so many kind and generous people. 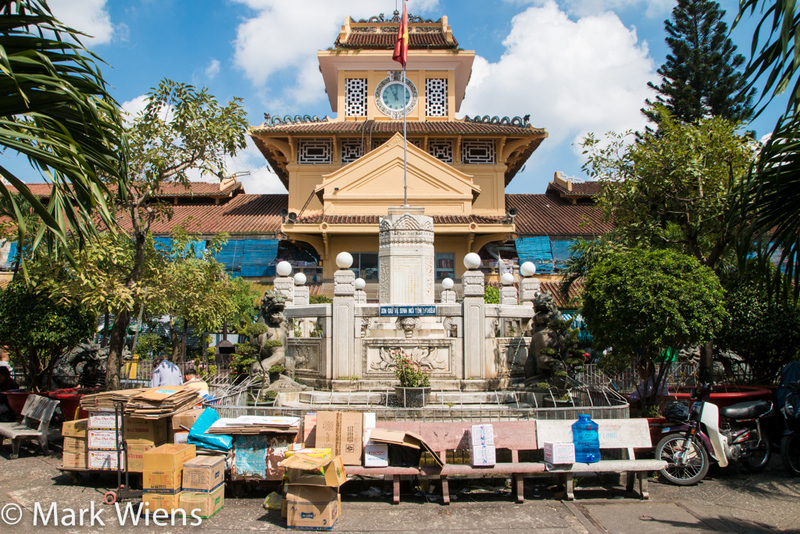 I love visiting markets and really enjoyed reading about your trip to Binh Tay. Glad you love visiting markets too Joey, thank you for reading. 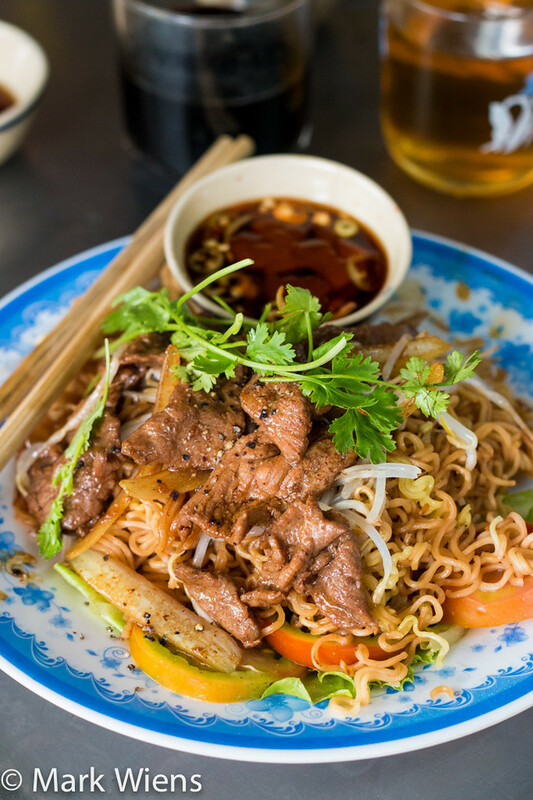 I can’t wait to visit Vietnam and go trough all these markets and shops, and try this delicious food they have on the streets, it looks so incredibly tasty. 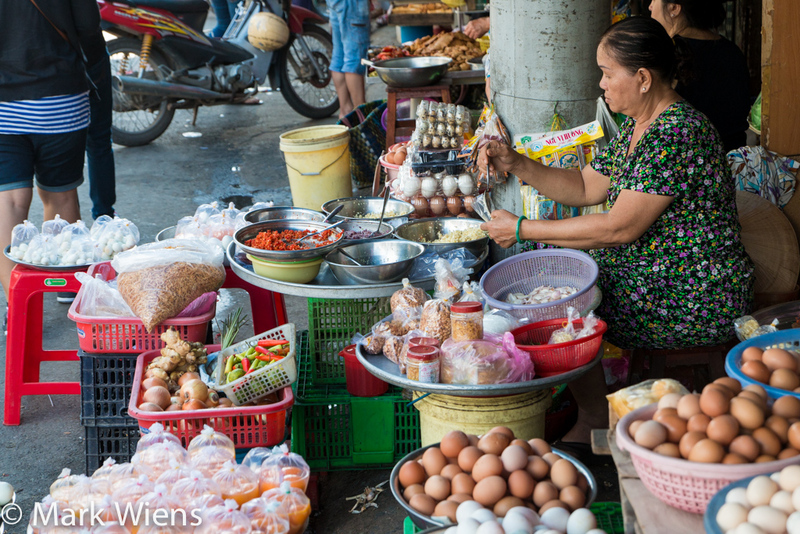 Hey Sigurdur, if you love markets and food, you’re going to love Vietnam. Hope you can visit soon.